Finally finished up my unit of plastic clone dwarfs, from the early 90s. They look fine, but definitely miss a shield or sixteen. If anyone reading this can help out with the classic shields give me a holler! My main goal was to paint them as fast as possible, to get a servicable table top paintjob. I might have overdone it a bit, as I did base coat, wash, base coat again and then highlight. I think the problem lies with the bases being finished last. The next batch of cheap plastics I paint up, I’ll do the bases after I’ve done the base coats on the minis. That way they might look finished earlier, say after a wash and a single touchup/highlight. Remember, I’m not aiming for the same level as on my metal guys. These are all about “army level” and I think I have to lower my ambitions a little if I ever want to finish any of the planned armies. The first six, as previously seen. They were painted in three batches. On the first six I used old Citadel Enchanted Blue for the coats. Thought they looked a bit too samey, so for the next five I planned to use Citadel Foundation Mordian Blue. I also decided to add partitions in Bleached Bone too and I must say it did wonders for the unit as a whole. 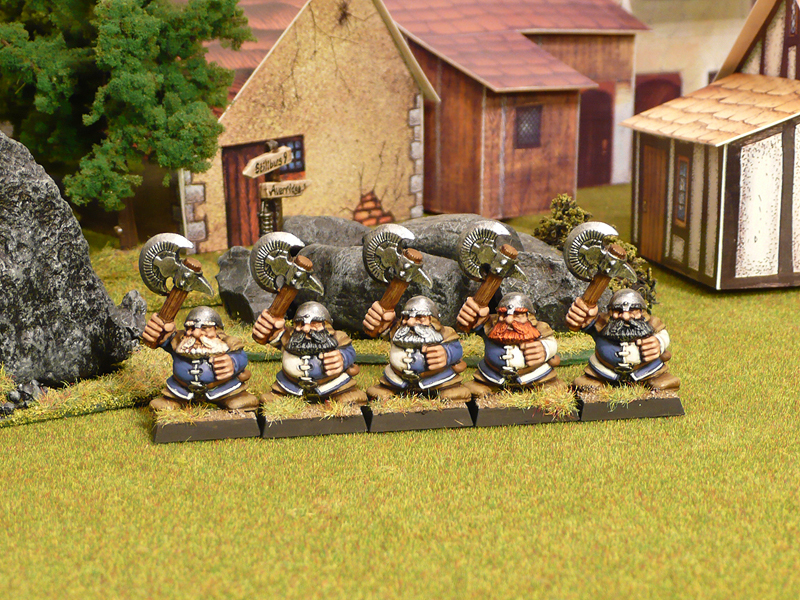 I couldn’t be arsed going back and add some white to the first batch I did, but any more dwarfs I paint will follow the same philosophy. The last five I used Citadel Ultramarine Blue on. I also alternated the boot and err… “collar” colour between batches, using either Vallejo Cobra Leather, Citadel Foundation Khemri Brown or Vallejo Earth as base. I alternated the skin colour too, using Citadel Dwarf Flesh on batch one and three, while the second batch got Citadel Foundation Tallarn Flesh. So, with these chaps out of the way I’m contemplating what to do next. Will try to get stuck in with the Doom Forgers as soon as possible. Also have some more plastics incoming, as well as the Grenadier plastics I got a while back. I think I’ll try to finish my human Blood Bowl team (based on 2nd edition chaotics and Phil Lewis’ Chaos Cup models) before I do any more Dungeon Bowl. Before anything else, I really ought to finish up some barriers for the next scenario of Stillburg though. Grand total for 2012 is now 62 painted – 220 acquired = -158. Managed to clear my goal of one model per week, and I have plenty of weeks to spare yet! Here’s a final pic comparing the three different batches. Comparison of the three batches. First in the centre, second to the right and third to the left. Or maybe the other way around. Who gives a damn? A while ago I mentioned how I’m looking to expand on my plastic dwarf army with some non Citadel additions; the plastic solid cast crossbow dwarfs from EM4 (previously Grenadier’s plastics from their boxed game Fantasy Warriors). Paul of sho3box fame kindly offered to send me a few. I got more than a few though, so thank you very much Paul (once again)! 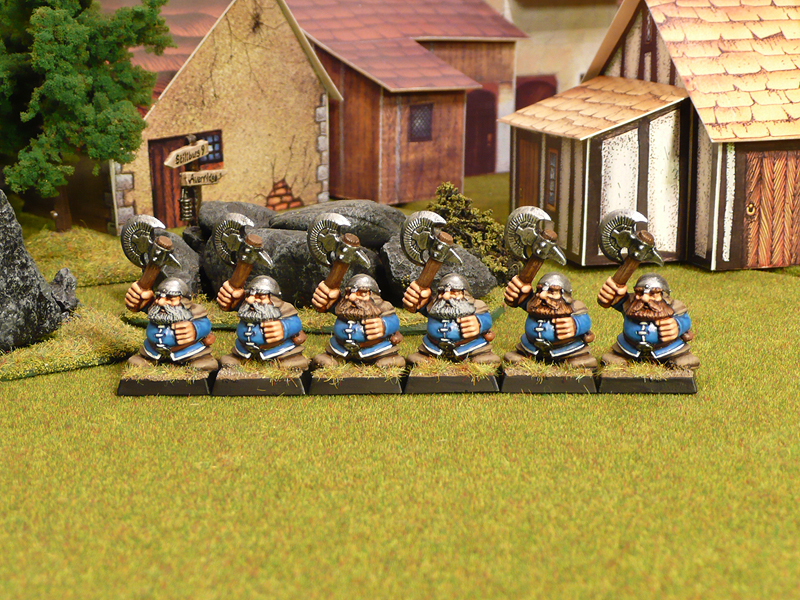 The dwarfs look solid size wise while the orcs are a bit small and will be used as hobgoblins for the poor chaos dwarfs who only would have one troop type available. It all depends on how they paint up though. Expect a review on that soonish. I also got a nice old Puggy Baconbreath (Citadel Blood Bowl star player) in the same shipment. Awesome mini! He’s filling the last halfling position in my Doom Forgers team and once I finish up the clone dwarfs I’m working on now he’s first in the painting queue. I’ve been busy painting a little recently, but can’t show the stuff just yet. 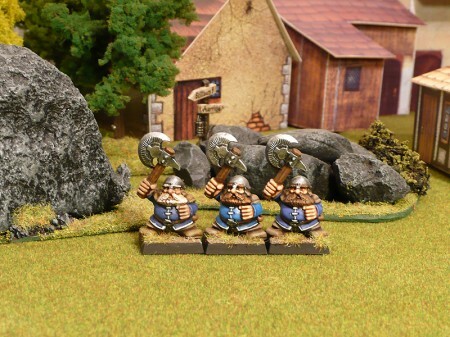 I’ve got an entry done for the Golden Gobbos (including a cheesy write-up and probably highly illegal WHFB3 stat line and special rules) and have finished a few more of my plastic dwarfs. I’ll post them as soon as I’ve got the whole unit done. Next week, probably. Do random small critters, possibly some 18mm stuff – just to get the annual total as low as possible (and because I really feel like painting small scale fantasy). 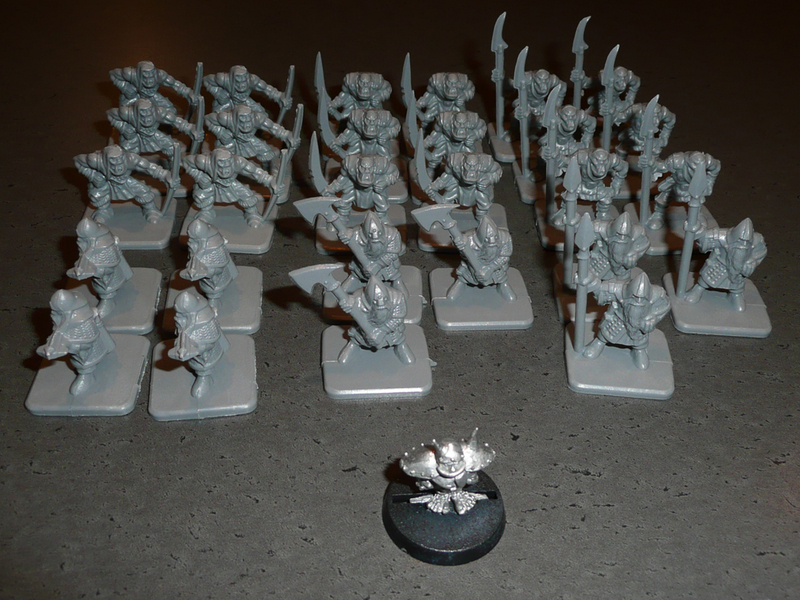 I’ve got a bunch of 28 mm wolves primed and ready for paint for instance. Also have some bats, lesser goblins (ie snotlings) and such to do. Yes, I’m going to use dirty tricks to sort out my annual total. While doing the above, I’ll also drop in on the Grenadier plastics from time to time. I’ve rebased some minis I bought painted from people over at LAF and those will be photographed and posted here soon too. It’s been a while since I posted anything painted. I normally don’t do musing blurbs on what’s going on in the online realm of miniatures but the Reaper Kickstarter really needs a bit of plugging. Go support Reaper’s Bones Kickstarter – now! For $125 (or just $100 if you’re in the US) you get an ungodly amount of knobrot miniatures! Look at all that un-lead! Seriously. Even I, who don’t much like the style of Reaper models, am going to pledge. At this time, you get just over 100 models for your $100, and the amount is ever increasing. I’ve been following how things progress over the last few days and I’m getting damn excited. DAMN EXCITED I TELLS YOUS! Yes, in caps. I’m even telling my wife and friends (none of which could care less) about this. They nod, tilt their heads and say “mhm… Anyways…” – but I don’t care. I’m so excited. I just can’t hide it. See? Pointer Sisters, damnit! I did a rather comprehensive and detailed plan for my hobby activities for 2012 in January. What good is a plan if it’s not reviewed and re-evaluated? That time is now! Unfortunately I don’t have much in the way of new photos to illustrate my progress. Would be too much of a rehash from the LPL recap. Finish the battle reports for scenarios 2 and 3, which I have done. That was quite a load off my back there! Paint the undead models needed for scenario 4, which I have also done. See painting back log below for details. Write up the rules and preamble for scenario 4, which is half done. I haven’t written the fluff but the actual scenario is finished construction wise. 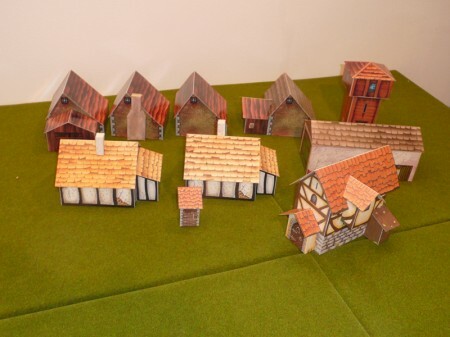 Build A LOT of houses for scenario 4. Not done by far. I’ve made several new buildings that I can use, but need plenty more. Here are my most recent additions, and yes – I know I ought to fix the edges and score lines with a pen but I’m focusing on getting as many as possible done as soon as possible. 1 x Necromancer Apprentice – Painted! 2 x Zombie Lieutenants – Painted! 10 x Zombies – Painted! 1 x Catapult – Painted! 3 x Skeleton Crew – Painted! 1 x Skeleton Captain (Mordini champion) – Painted! 1 x Zombie Hulk – Painted! So, of 29 scheduled minis in this project, I’ve painted 19 and have 10 to go. All the minis needed for scenario 4 are done, and most for scenario 5 and 6 too! I haven’t started on the scratchbuilt wizard’s tower for scenario 6. No problem there, it’s more in the scope of 2013 or 2014 to play scenario 6. Same goes for the dungeon tiles (but will need those for Dungeon Bowl real soon like). In addition to the undead above, I’ve finished painting several (5 out of 7) of the ally models I have planned for the heroes! No rebasing done yet, and I even have a few more minis to rebase now (painted by LeadAsbestos). I have touched up the civilian models I need for scenario 4 in Stillburg, and have them and several others mounted on proper bases waiting for gravel, paint and flock. No progress made on the dungeon tiles for this, but will have to fix them up rather soon as I hope to play some Dungeon Bowl next week when a friend visits. I’ve finished roughly half the Doom Forgers team, while all other teams are still bare uncleaned metal. The collecting of the teams is going quite well and I’ve even started compiling a few extra team lists for the races not included in the original 2nd edition Dungeon Bowl teams (chaos, chaos dwarfs, wood elves, high elves, amazons, norse, nurgle, vampire, necromantic and khemri). Nothing happening here, but I’ve tried a rule set (Brink of Battle, from Robert “Faust23” Faust) that I think will work quite well for regular troopers. The project is definitely on hold, but can be whipped out at any time as I have the rules, the miniatures (prepainted plastics) and everything else needed. I lack properly Star Warsey terrain, but could well do some forest planet with my fantasy stuff. Haven’t found a single goblin for this project, apart from the three I had allready done. Have mounted and primed a bunch of the animals though, and they’re moving up the painting queue in order for my total tally this year to even out (-ish…). Stay tuned! No progress here… though I did get Ganesha’s “Tales of Blades and Heroes”, which seems to be a pretty decent fit for a dungeon crawl. Also on hold, though I’m hoping to paint some more tiny dwarfs for exactly the same tally related reasons as stated above. The champion from Mordini’s have been painted and I’ve stripped a few other models (Grom’s pre-slotta guard, Redemptionists and Knights of the flame command). Not much else happening. Nothing yet, but I did get samples from Zuzzy. Liked them, but they were very flimsy and would require support on my table as it’s 100×200 cm. I would like the playing area to be 120×180. Proceeding rather nicely on this! It’s week 31 as I type this, and I’ve got 51 models painted so far. 2. Finish scenario 4 for Stillburg and play the damned thing! 3. Base up allready painted miniatures. 4. Get the Doom Forgers DB team finished. 5. Get another starting team done for Dungeon Bowl. 6. Paint lots of tiny little guys to bolster my annual total! I’ve owned a set of 16 plastic dwarf warriors since the mid 90s. Tried to sell them several times, but it never panned out. Not even for a quid. I tried GIVING them away. No dice… So, I succumbed and started painting them recently. One thing led to another, and now I have a rough plan on how to set up a few 1000-ish points of forces for WHFB 3rd edition, based properly on slottas and all. I’m sticking to solid cast plastics as far as I can. 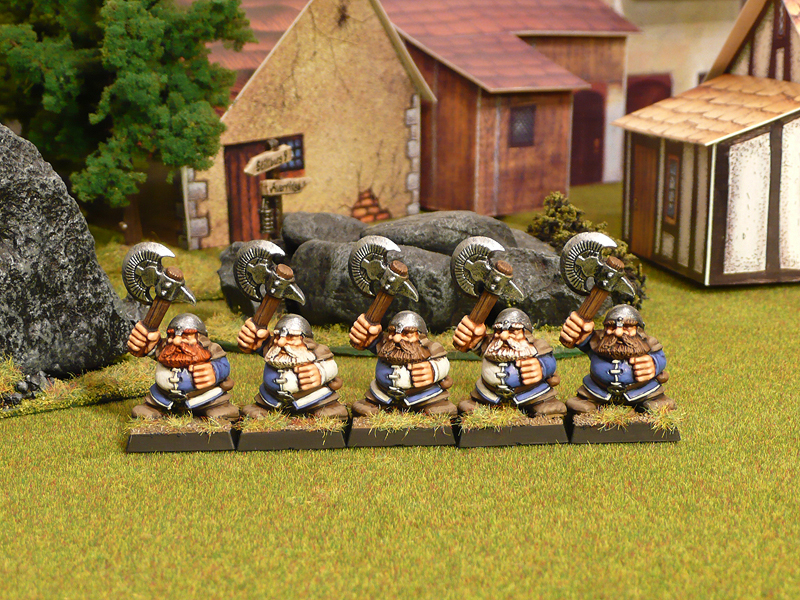 It’s a slow burner, but if I get some more dwarves from Paul over at sho3box they’ll get bumped up the priority list. I’ll post a full description of this any day now, I’ve got all the models (and then some) and need to decide on whether I want to paint them myself or ship them off to have them painted for me. 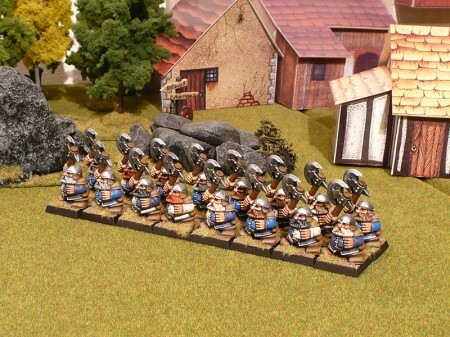 It’s a mix of old Metal Magic, Citadel and Ral Partha with a sprinkling of Olley’s Armies trolls (huge!). I really want to do them myself, but at the same time it’s a bit of a daunting project and having them sent off for a commission would be a good way of getting them finished quickly. Not much painting involved in this, I’ve already have most of what I need painted and would only have to complement with a few pieces here and there. Inspired by the campaign over at Chicago Skirmish Wargamers’ blog. Biggest problem is to get an engine up for the map parts and then to find mates to play it with.